Sea, street art, (including a Banksy) fabulous regency architecture,grand art deco, aristocratic parkland, the rich, the poor, the trendy and all within a kilometre of St Leonards Station! St Leonards was conceived as an exclusive seaside development at the very end of the Georgian period. During the 19th century the town expanded and merged with nearby Hastings. In the second half of the 20th century holidaymaking by the sea in Britain declined and the area suffered. Slow rail journeys meant that the town was unable to attract affluent commuters and the geography of the area meant that the town found it difficult to develop new industry. The cheapness of the housing attracted slum landlords and by the beginning of the 21st century the central St Leonard’s ward, which is the scene for much of this walk, was one of the very poorest in the whole country. But in the last few years cheap attractive housing has drawn in artists and others priced out of East London and Brighton. You will see lots of evidence of these trends on the walk. The walk is all on tarmac, but there are a number of hills and some steep steps. Numerous in the first and last parts of the walk My favourites are the traditional café by the railway station (closes mid-afternoon), “Relax” under Marine Court and the Love Café on the corner of Norman Road and London Road. Poffleys under Marine Court has also been recommended. No toilets on the station in 2014. There is a public toilet at Warrier Square on the on the promenade. The station was built by the South Eastern Railway in 1851. The station building on the south side is original. The railway company were defrauded by the contractor building the line, who built many of the tunnels on the line to a poor standard. The company had to line the tunnels which made them smaller. For a long time special trains were used, but now the track has been singled through many of the tunnels. This makes train times much longer and communications more difficult. Notice that you can already see that there are businesses which cater for people with little money and those that cater for more trendy people with a little more money, side by side. Take the first left into Warrior Gardens and walk up about 10 metres. Two things to look at here. Firstly, on the wall of the building on the corner is our first piece of street art. What do you think of it? (Warning, street art in St Leonards does come and go quite quickly). Secondly, what is the fortress on your right with careful planting on the top? It has no signs on it. Locals I asked suggested that it was either a water treatment plant or something to do with electricity, but why no signs? Continue up Warrior Gardens. Take the second turning on the right, Warrior Square. Walk down to the square itself and take the first entrance into the gardens on the right..
A). For information about the square see below. Walk diagonally across the gardens, taking any route that you fancy, so that you end up at the bottom end of the gardens on the opposite side. On arrival, you may want to do a little diversion to your left to look at a classic statue of Queen Victoria looking, as usual “Not amused”. Her Majesty was machine gunned during the last war and you can see a bullet hole in her right knee. 1). Cross the road and turn right along the promenade. Just to your left is a sculpture with a number of hooks on it, to which members of the public have added locks, necklaces and other things significant to them. Behind you can see the pier, currently derelict but being renovated. Your route takes you on top of the promenade, but notice that there is a double deck promenade here. The lower part is called Bottle Alley not, as you might think, because of the street drinkers, but because the wall in the eastern part has huge amounts of bits of bottles embedded in it. These were set in the concrete when the promenade was built in the 1930s. Bottle collectors can find bits of bottle now long gone. B) Soon the huge bulk of Marine Court becomes visible. See below for more information about this. Cross the road at the beginning of Marine Court to have a look at the various businesses that have set up to try their luck in the shops on the ground floor. Cross back at the end of the court to re-join the promenade. Continue in the same direction. F) Pass Crown House on your right. For more information about this see below. 2) Come to St Leonard’s parish church on your right. On your left you will see steps leading down to the beach. Take these. Turn right at the bottom and right again to the rear of the steps. D). The street art here is generally accepted as being by the famous graffiti artist Banksy. Notice that the work has been covered over to protect it. Graffiti art protected from graffiti? How post-modern is that? Climb back up the steps and carefully cross the road. Walk up to St Leonards church. E) See below for more information about the church. To the left of the church is a steep set of steps which winds up the hill. Take the steps to the road at the top. Turn left along West Hill Road. This is part of the later Victorian development of the area. Take the first on the right (Boscobel Road) and walk up the hill. On your right is the Highlands Hotel, now a guest house and bar open to non residents but originally a building with grander pretentions. This is the first of a number of grand buildings that you will pass built in local sandstone. Have a look at the old stables, seen through a high archway. During the walk you can see contrasts between the grandiose high Victorian style which contrasts with the more sober Georgian form, even though some of the work in the Georgian style was built in the early years of Victoria’s reign. Boscobel Road and Pevensey Road contain grand examples of both. Turn right into Pevensey Road. Have a look at the great edifice of the Highlands on your right. It is now in flats. Turn left down (G) Archery Road, then left into the Mount (H). Follow the Mount round the back of the tennis court to return to Archery Road. Turn left. Notice the (currently derelict) Archery Villas on your right (I). Turn right down Quarry Hill. Come to a group of buildings from Burton’s St Leonards,(J) including the assembly rooms and the South Lodge. Just to the west of the South Lodge is a Burton double Villa. Turn left through an arch in the South Lodge to come to St Leonards Gardens. James Burton was involved in setting out Regent’s Park in London and the idea there, as here, was to set out a number of grand houses in and around parkland. You can see some of the houses on your right. What looks like a church in front of you is, in fact, Clock House,(K) a villa fronting onto the park on three sides. Walk ahead uphill through the park. Pick any route that looks interesting. This is a good place to have a picnic. At the top end of the park you come to the North Lodge (M) Before passing through it you may want to turn right along Maze Hill to look at the rear of Clock House and the Uplands Villas (L), although the Uplands are difficult to see from the road. Walk through the archway of the North Lodge and then past the former home of Alan Turing on the right.(N). To take a short cut, turn right before the church down Kenilworth Road. Rejoin the main route at the junction with Rothsay Road. The area to the north of here was still being developed in the first 10 years of the 20th century. The writer Robert Tressell wrote his famous book, “The Ragged Trousered Philanthropists” about the hardships of the workers building these houses at the time. You are now heading into the later development of Upper St Leonards. Notice the fairly tasteless infill pseudo Georgian building in places. There is quite a lot of infill in Upper St Leonards. Some of this may be the result of bomb damage. The town was heavily bombed during the 1939-45 war. Cross Dane Road and continue ahead with Markwick Gardens (O) on your left. 5). Take the next right into Charles Road and arrive at Gensing Gardens (P) You can take any route that you like through the gardens, but you need to end up at the other end of the Gardens and turn back into Charles Road again. Continue along Charles Road, which bears left when it meets Dane Road. 5) Cross Pevensey Road again and head down Cardiff Road. There are no sights as such in the next stretch, but you might want to read the section below “Regeneration or Degeneration?” Turn right into Stockleigh Road and then left into Carrisbroke Road and first left into Rothsay Road. Turn left at the end into Kenilworth Road. Alternative If you took the alternative short route you will rejoin the main route here. At the next junction Silchester Road goes off to the left. But you turn RIGHT here up a tarmacked path past modern houses. At the end of the path turn left. You will see a junction. It is worth taking the left hand fork to look at the houses in the Lawn (Q) Often the gate at the end of the Lawn is unlocked, letting you out into Stanhope Street – if not you will have to retrace your steps to the junction, turning left and then left again. The houses in Stanhope Street were built for the workers who were to provide services for Burton’s town. Although these houses were comparatively modest, you can see that gentrification has taken place. Walk down Norman Road and come to a junction with a main road (London Road). Turn left along London Road and then diagonally right along Kings Road to return to the station. London Road features as “The Hill” in “the Ragged Trousered Phillanthropists” Building site workers would walk from the offices and yards of their employers in this part of St Leonards, up the hill to work on the grand houses of North St Leonards. Robert Tressell’s last home in Hastings was in a top flat 241 London Road, north of Gensing Gardens. According to Wikepedia “The site was opened as a subscription garden in 1852. The Council purchased a strip of land at the southernmost tip to erect a statue of Queen Victoria in 1902. All but the uppermost rose garden was acquired by the Council in 1920 with the upper garden being donated to the Council in 1930” The walk takes you past the delightfully named “Bumptious Mansions” at 15 Warrior Square. It is clearly a design classic but the flats are small and the ones at the back are dark and pokey. Its recent history is typical of that of many large blocks of flats. Blocks like this are owned by a freeholder who may grant residents leases of 99 years or even more, or may let the flats on short term tenancies. While there are a large number of tenants the freeholder runs the property down, because the tenants cannot be made to pay directly for repairs. However when there are a significant number of leaseholders the landlord starts doing repairs, because the leaseholders must either pay for the repairs or lose their flats. Sometimes the freeholder swindles the leaseholders by getting associated companies to do the work at inflated rates, although Marine Court never got to this stage. A response to this is for leaseholders to get together to buy the freehold. This has happened at Marine Court where a company controlled by leaseholders now owns the building. However the company may not be acting in the interests of all the residents. In order to do repairs sums up to £30k have apparently been demanded from leaseholders. This is fine for affluent owners of the more expensive flats at the front, who will see the values of their flats increase in value, but tough on residents at the back, where the flats are only worth about £90k and are not likely to increase in value much. It is also tough on those who cannot lay their hands on the money. The writer Ian Sinclair has a second home in the block and his novel “Dining on Stones” features it. This is the first building on the walk that dates from the original building of St Leonards as an exclusive seaside development by James Burton, starting in 1828. Every seaside development must have a hotel for short term visitors and this grand edifice was designed to be the landmark building in the development. You can still stay in it. This was the first building in Burton’s development. James Burton lived here during the construction of the town. As part of the original St Leonards development there were grand villas,gardens and an archery ground in within the area bounded by Archery Road. In the 1960’s these were torn down and replaced by Hastings College. This development gave rise to the Burton St Leonard’s Society Now the college has moved and developers want to build flats and houses there. The first scheme was rejected as being a gross overdevelopment of the site. At the time of writing a further development was being considered. Let’s hope it fits in. The road gets its name from the practice of archery in the area bounded by the road. 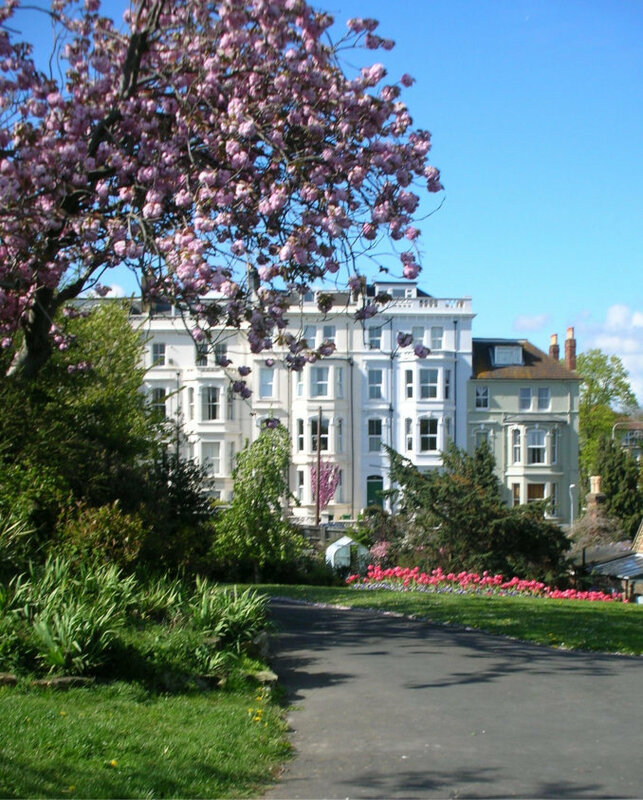 The Society of St Leonards Archers was set up by Eliza and Charlotte Mackay who developed, landscaped and maintained the grounds. The web site of “Save the Archery Ground” has more information about the site. This crescent of houses was designed by Decimus Burton, the son of James. The tennis court is on the site of an ornamental garden. These villas were also designed by Decimus Burton. They have been used for educational purposes since 1861 and were part of Hastings College after the 1960s. Developers now want to turn them back into housing. These buildings are behind the Victoria Hotel. The assembly rooms were the site of social activities in the new town. The south Lodge is the southern entrance to the park and is now the home of the Burton St Leonards Society. It is open Wednesday 11am – 2pm, Saturday 11am – 4pm, Sunday: 1pm – 3pm. Just to the east is one of the orginal double villas designed by Burton. Another design by Decimus Burton. See the section on The Lawn for more information. Originally a toll gate for the toll road that ran from here to the London road. It was once the home of Henry Rider Haggard who wrote King Solomon’s Mines. Just north of the lodge, on the right, is a building that was once the home of Alan Turing, who was a mathematician, logician, cryptanalyst and computer scientist who was heavily involved in the breaking of German codes in the second world war He was officially persecuted after the war for his sexuality and is believed to have killed himself as a result of this. Once a private garden for residents, the gardens are now open to anyone who joints the Markwick Gardens Association, but the membership is a bit steep for anyone who will not be using the garden a lot. The walk goes up the east side, which has mainly later Victorian housing. You may want to have a look at the west side of the gardens, where there are houses of an earlier period. Bought by the council in 1872 and a public park since. In winter it can look a little bare, but in spring it is a wonderful site. Has a children’s playground. Here are some pictures from one happy nearby resident. The oldest pub in St Leonards, built for the workers building Burton’s St Leonards. Sells Harveys too. This corner was originally where the washerwomen servicing the town were based. It was called “Lavatoria” The street in which the pub is situated is called “Mercatoria”, the place of the tradespeople. Originally built for the working classes serving St Leonards, now trend central, with a soviet art gallery, trendy café’s, fashionable clothes shops, antiques and a mural of the top half of Prince Charles’s head. Where else could you finish? The street that sums up modern St Leonards. Shops selling the very basics next to upmarket goods stores, charity shops next to antique stores, a couple of shops selling alcohol for alcoholics just down the road from a wine shop selling bottles with price tags in 3 figures. (Nearly) All St Leonards life is here. There are no single “points of interest” in the area just south of waypoint 6, between Pevensey Road and Kenilworth Road, but this area is, in some ways, the most interesting area on the walk, because it summarises the issues facing St Leonards and its residents. This area, like much of the walk outside of Burton St Leonards, is in the central St Leonards council ward, a ward with some of the highest deprivation in England. As you walk through the area you can see that it consists of tall thin Victorian buildings. They have hardly any back gardens. This means that they are not very suitable for single family housing. They can be converted to flats but anyone doing a conversion would need to be fairly sure that they would get back the money they put in. Because property prices in the area have been so low on account of poor job prospects many “respectable” developers have been deterred. Hastings and St Leonards still has a problem with houses left empty, but there are also many places that have been bought by slum landlords and either converted cheaply and badly into flats, or left as bedsits, a form of housing which is almost dead in many parts of the south-east. The problem has occurred in many seaside towns in Kent as well. In recent years many south east London councils have been tempted to give people they could not house or who caused them problems a one way ticket to Hastings or Kentish towns to get rid of them. Landlords therefore had a ready market for cheap, poor accommodation. Recent government benefit reforms tend to make the problem worse. And once an area gets a reputation for problems people try to leave if they can, forcing rents and standards down still further. And once an area gets a reputation for problems people try to leave if they can, forcing rents and standards down still further. The standard remedy for turning this round is for councils or housing associations to start buying up property in the area and managing it responsibility. The local large housing association has started doing this and the council has undertaken a number of initiatives in the ward to promote good order and community life. It is hoped that this will start to make people want to live in the area again. But who is going to want to live in these properties? In Brighton there are a lot of similar tall thin houses. Here this type of housing is sought after by students and young mobile professionals, including a large lesbian and gay community. Can St Leonards attract these groups of people? There is no big university, although Hastings has managed to persuade Brighton University to outstation some of its courses in the town. The poor train links make things difficult for mobile professionals. As you can see the town is becoming attractive to some people, including artists, who like the old housing and the boho vibe and are not too worried about commuting or a slightly gritty atmosphere. Is this enough? Is it desirable? When they have children of secondary school age will the like the schools enough to stay? 40% of employment locally is in the public sector. With government attacks on this will the economy contract further? If housing takes off what will happen to the people who can no longer live there? All this is being played out in the streets you are walking through. What do you think is happening? Very helpful, but responsibility for any mistakes is mine.